In Sweden there are official "flag days". They are marked in the calenders and they are usually due to a religious holiday (that no one really celebrates any longer, but sure enjoy the time off work) or a royalty's birthday or name day. You are also free to raise the flag for other reasons - and when in the summer house in Sweden, we usually do on someones birthday. You can't raise the flag before sunrise or before 8 am and you have to take it down before sunset or no later than 9 pm (in Summer the sun sets way later than that). Here there are no clear flag rules - at least in the Swedish sense. 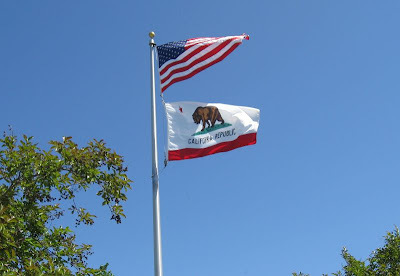 You'll see flags up 24-7 - and here in California, you usually see two flags on the on the flag post, the US flag on top and the Californian flag underneath. I like both ways. I like flags. I wouldn't mind having a flag post in the back yard - but that you never see here. If people put op flags it's usually on a small flagpole attached to the wall of the house. I wonder if there is a rule on flag posts in private back yards? Flags at my Daughter's Elementary School last Friday. As you probably know the official "Flag Day" is in June (the 14th- my parents' anniversary). Otherwise traditional flag days are holidays related to war/government (Independence Days, Memorial Day, Flag Day, Veteran's Day). When I was a child, it was pretty common for people have flags flying for those days. Now it's mostly older people who put them up. But as you said, not with a flagpole. What I couldn't get over in Sweden is all the places Swedes came up with for using their flags (Christmas trees, birthday cakes, graduation, etc). Probably as an American, I few the usage of the flag as more of an official symbol than one that I would associated with my person. Hmm that would be "view" not "few". Yes I am a native speaker and still can't talk/write. Ally - But how would you know that there is a traditional flag day... isn't the flags up more or less always? *thinking*... Our neighbor just got a "garage flag pole" and I have interestingly been studying if there is a pattern for when they put it up, but I've come to the conclusion that they must put it up and then forgetting to take it down, because it's up for days at a time... (I like when it's up however - I like the American flag and flags in general). I've been checking my calender to see if something is going on, but I haven't cracked the pattern yet (and starting to doubt there is one). The rules about when you should raise and lower a Swedish flag are looooong gone - you are most certainly allowed to keep your flag raised at any time of day these days. Sara - I did some googling and found it's not really a "rule" but a tradition and a recommendation (http://www.statensarkiv.se/default.aspx?id=1267). In my experience you rarely see flags raised 24/7 (except the "vimpel") in Sweden compared to here. On the summer island where I spend my summer my parents are pretty strict about the recommendation - as is most of the neighbors. I like the tradition of the flag in Sweden - makes it a bit of a ceremony when you raise the flag and take it dow - and the special occasion are more special. And I think I shall always put the Swedish flag garlands in our Christmas trees! My mother did this and I've continued to do it as well. She didn't bring them from Sweden though; she bought them here in CA (down in Solvang). ur blog has really made me wish to visit the beautiful Switzerland. i do not know at this moment. but i promise u whenever i will hv tht much of resources i will definitely visit Switzerland. I agree with Ally. Here in Sweden the Swedish flag is all over the place. Birthday cakes, in Christmas trees, certain greeeting cards, graduation stuff, on the table at certain dinner parties, midsommar celebrations, etc., etc. I've never quite gotten used to seeing a flag used so much, but it doesn't really bother me. You are not allowed to have the swedish flag on your clothes in school anymore, not to offend immigrants coming to Sweden. I've heard that too, from my friends in Sweden, that wearing the flag on your clothes or even saying, "I love Sweden," is somehow racist or something. I don't really understand. It seems like one can welcome immigrants at the same time that you feel patriotic and love your country. I'm glad someone brought that up because I've been wondering about it. I love the Swedish flag and can totally see myself walking around the country sporting an "I love Sweden" t-shirt and having no idea I was being offensive. 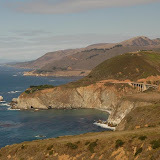 Northern Californian - interesting input - maybe you're right. I can't really remember I had that much stuff with the flag on - and as you say - definitely nothing on clothes. But you might be right - maybe it's more common to have the flag on clothes here. Even though I picked up some American "stuff" at Target as gifts to bring to Sweden- before Memorial Day - and the upcoming 4th of July - there were all kinds of things with the flag - haha. Anonymous - "allowed" might not be the right word - but unfortunately I think that ideas about nationalism has taken a wrong turn in Sweden unfortunately - that's what I like about the American flag here - it has not the same unfortunate annotation as in Sweden. Indie - yes, the wrong crowds have tried to claim the right to the interpretation of the flag - and that is so sad. I don't really understand either and I would hope for the Swedish people to take back the right to the flag and be proud of it. Of course you can welcome immigrants at the same time as feeling patriotic- most other countries manage that. Things have just taken an sad path in Sweden when it comes to the flag as a symbol - especially when wearing. Anonymous - nope - jag har bara varit lite seg att lägga upp inläggen - mycket med jobb, planering och fix och helger. 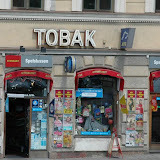 ;-) Glad att någon undrar!